A heating, ventilation and air conditioning system is probably one of the biggest investments you'll ever make in your home. As such, you may be wondering how long this important investment will last. To some extent, this is akin to forecasting the lifespan of a human being. Yes, you can review actuarial tables for a general idea, but much depends on regular care and maintenance. Take care of your HVAC system, and it will reward you with longevity. Heating and air conditioning professionals often tell clients that under "normal" operating conditions, their HVAC system could last between 15 and 25 years. Furnaces tend to outlast air conditioners; cooling units can last up to 20 years, while furnaces can last up to 25 years. The all-important factor in these ranges is regular maintenance. 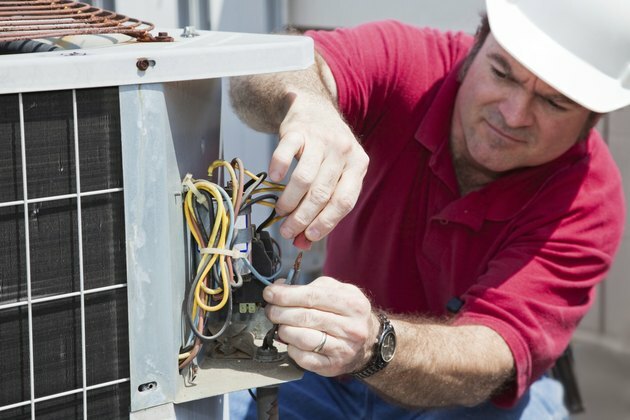 Just like your car, an HVAC is a complex web of moving parts that can benefit from a yearly "tuneup": once in the spring for air conditioners and once in the fall for furnaces. Dirt is the biggest enemy of an HVAC system, causing it to run inefficiently and consume more energy. So in addition to a good cleaning, a yearly maintenance inspection usually includes a check of all the internal components. The inspection also should bring any minor mechanical issues to light before they mushroom into bigger and more expensive ones. You can do your part by checking your air conditioner and furnace filter monthly during the respective "high" season. A clogged filter breeds inefficiency under the best of circumstances and the risk of a complete shutdown under the worst.